Source: Rickert et al., 1976. Figure 13-3 Monthly mean, tenth, and ninetieth percentile streamflow of the Willamette River at Salem, Oregon (USGS Gage 14191000), 1951-1980. 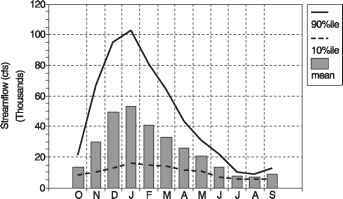 Source: USGS, 1999.
range from 6,246 cfs in August to 48,060 cfs in January (Figure 13-3). 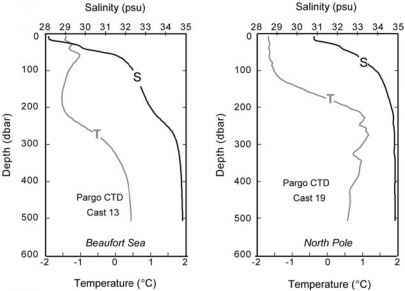 Before 1953, the natural summer low flow ranged from 2,500 cfs to 5,000 cfs at Salem. Since 1953, flow augmentation by 14 U.S. Army Corps of Engineers (USACE) reservoirs has been used to maintain a summer low flow of about 6,000 cfs at Salem (Hines et al., 1976) (Figure 13-4). 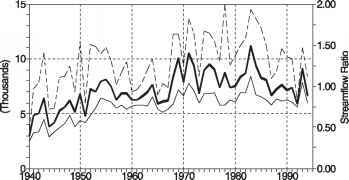 Figure 13-4 Long-term trends of summer mean, tenth, and ninetieth percentile streamflow of the Willamette River at Salem, Oregon (USGS Gage 14191000), July-September. Source: USGS, 1999. Because of abundant natural resources, the river has played a key historical role in the agricultural and industrial development of the valley. The Willamette River, a major source for the basin's municipal (20 cities) and industrial (600 facilities) water supply, also provides irrigation water for the rich fruit and vegetable farms of the valley. Other major uses include commercial navigation, hydroelectric power production, commercial and recreational fisheries, and water-based recreational activities, including aesthetic enjoyment of the Greenway Trail along the length of the river. As the region has grown, the river has also been used, and misused, for municipal and industrial waste disposal, including the disposal of wastewater generated by the pulp and paper industry since the 1920s. Oregon's three largest cities—Salem, Portland, and Eugene—with a total population of 1.8 million (nearly 70 percent of the state's population) are within the Willamette River basin. The population of the basin has steadily increased since World War II. With a significant wood products and agricultural economy, the Willamette basin accounts for about 70 percent of the total industrial production of Oregon. Industrial production, like the population of the basin, has steadily increased over the past several decades. The Willamette River case study area includes a number of counties identified by the Office of Management and Budget (OMB) as Metropolitan Statistical Areas (MSAs) or Primary Metropolitan Statistical Areas (PMSAs). Table 13-2 lists the MSAs and counties included in this case study. Figure 13-5 presents long-term population trends (1940-1996) for the counties listed in Table 13-2. From 1940 to 1996 the population in the area more than tripled (Forstall, 1995; USDOC, 1998). 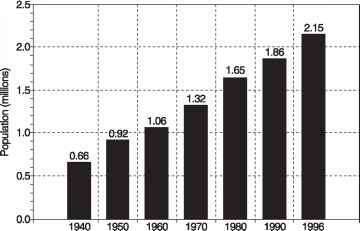 Figure 13-5 Long-term trends in population in the Willamette River basin. Sources: Forstall, 1995; USDOC, 1998.